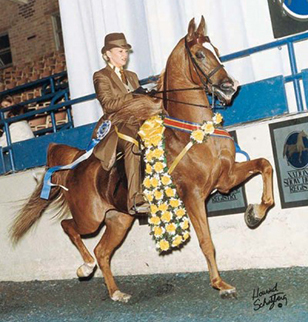 A 1988 chestnut gelding by Starkhan and out of the Saddlebred mare Singletree’s Melody, Allfired Upp has had an amazing show career since his debut in 1992. His recognition in the English division includes an incredible 14 regional championships, eight Canadian Nationals Top Ten awards, eight U.S. National Top Ten awards and Reserve Canadian and U.S. Nationals titles. Allfired Upp was 1997 Canadian National Champion in the Half-Arabian English Pleasure Adult Amateur Owner to Ride 18 – 39 class and 2002 U.S. National Champion in the Half-Arabian Country English Pleasure Adult Amateur Owner to Ride 18 – 39 class. He remains a show ring presence today. His recognition in the English division includes an incredible 14 regional championships, 8 Canadian Nationals Top Ten awards, 8 U.S. National Top Ten awards and Reserve Canadian and U.S. Nationals titles. Allfired Upp was 1997 Canadian National Champion in the Half-Arabian English Pleasure Adult Amateur Owner to Ride 18 – 39 class and 2002 U.S. National Champion in the Half-Arabian Country English Pleasure Adult Amateur Owner to Ride 18 – 39 class.